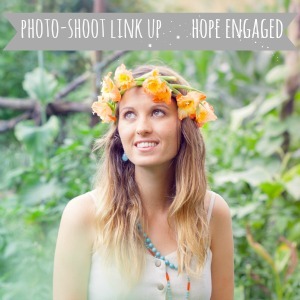 Today I am so excited to be linking up with some amazing women in the blogosphere. Katie from Hope Engaged sent a few of us a challenge. She wrote, “I thought it would be fun to each do a little photo shoot of each of us! I find I get so inspired by seeing the beauty in others.” And I could not agree more. It is so fun celebrating the beauty of others. That’s one of my favorite things about blogging – meeting and learning from new friends that I probably would have never met otherwise. And the opportunity to celebrate their unique beauty and experiences is an honor. So thank you Katie! For being such an inspiration to me and challenging us to find ourselves beautiful today. For my “beauty shoot,” I decided to do things a little different. A part of me really wanted to get all dolled up, curl my hair and have Matt take some pictures of me. I mean with a 2 week old babe at home, showers are a luxury and the chances to get dressed up are few and far between. But then I thought about where I am in life right now. And right now beauty does not look the same as it did even 2 weeks ago. My beautiful comes in a different form these days. It comes in the form of always wearing glasses instead of contacts. Crazy hair, often times on top of my head. No makeup and yoga pants or comfy shorts. And who’s to say that’s not beautiful? I think my little Miss Priss would tell me I look beautiful every day when I hold her and snuggle her. So at the risk of feeling vulnerable here are some “beauty shots” of me lately. No makeup, just cuddles. i think you are STUNNING! being comfortable enough with yourself to be vulnerable is so important. because beauty is not in our makeup but in our hearts :) so glad i found your blog through katie's sweet link-up! I LOVE that you did this. So honest and still so absolutely gorgeous. You ARE beautiful and so is your little one! It's a good thing that you can recognize and appreciate that! You are such a babe. Motherhood looks good on you! And G is beyond perfection. Love her little outfit. You look so amazing little Momma!! And that little girl of yours is just as pretty. Loved this. I believe there is something that happens when a women becomes a mamma! There is a change a shift maybe it's an alignment and it makes her simply beautiful in a mysterious kinda way!!!! You definitely epitomize that new mother beauty!!! Ps Congrats on the birth of your little one! Aww great idea! And you're stunning!! So is that precious girl of yours! you're gorgeous!! And just look at that little angel!!! She is so precious!! I enjoyed this link-up as well! Ummmmmm you look amazing for having a two week old. After I had Ryder I could barely articulate a sentence and looked like an old hag.